Khandvi is an absolutely delicious, traditional savoury snack of Gujarat, made with gram flour and yoghurt and a perfect option for breakfast or evening snack. 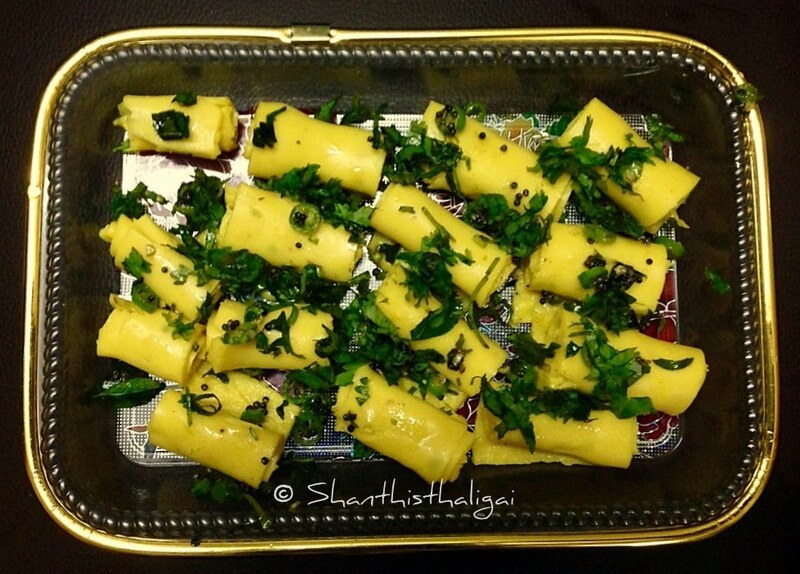 My daughter-in-law Shruthi, makes perfect, soft textured khandvi rolls. Making translucent and paper thin khandvi is truly an art, in which I should say she is an expert. Recently she made khandvi and sent this picture to me. The wonderful yellow colour caught my eyes and here is the recipe. Ginger-green chilli paste - 1 tsp. Lemon juice - 1/4 tsp. Finely chopped green chillies - 1/2 tsp. Whisk curd and water. Combine besan with green chilli-ginger paste, turmeric powder, hing, salt and lemon juice. Add curd gradually and mix well without any lumps until smooth. Grease the back side of the tray and the spatula with 1/2 a spoon of oil and keep it ready. Heat a pan, add the mixture and cook on a low flame for about 10 minutes. Stir continuously until it becomes thick and glossy. Switch off the stove. (NOTE: Once the batter is out of the stove, you have to spread the batter very fast while it is hot). Spread the mixture on the back of the greased tray while it is hot. Immediately level it with the spatula, as thinly as possible. Arrange the rolls in a serving tray, temper with the ingredients given in "to temper"and pour over the khandvi. Garnish with coriander leaves and coconut. Serve immediately with green chutney. Yummy it looks. We all like khandvi but I never tried at home.